An hour’s scenic plane ride away, Equator Village, located on the upper tip of Addu Atoll’s heart-shaped landmass comes in a package of unique beauty and intriguing history. An exotic adventure begins, the moment you start your journey to Equator Village. This is not your typical Maldivian resort; this is an equatorial escape into a land of culture and nature entwined together. The resort is vast in size, with a forestry of green, large shady trees looming overhead. This makes for incredible bird watching in the evenings and early mornings as trees are busy with the ‘Dhondheeni’ who call these their home. Tree lined pathways through courtyard gardens lead to the quaint and chic bungalows, in the midst of tropical blooms, each with comfortable white wicker seating in spacious verandas. Only a few feet away from the rooms are soft sandy beaches and inviting turquoise waters that sparkle beyond the beaches. With the unique blend of beauty, rich history and endless possibilities for adventure, Equator Village is the ideal getaway for those who wish to experience a different side of the Maldives. Stayed for two days. Service was excellent and homely. Requested for a twin bedroom which was not ready but they promptly arranged for it. Spent the day in pool with excellent cocktails and sandwiches. Really memorable experience. A lovely hotel with fantastic staff, super friendly and welcoming. If you want a taste of the real Maldives, away from the world of constant selfies and over the top prices, come to Gan Island. The hotel staff are some of the friendliest we have met, and we travel all over the world. We wanted to check out the Maldives for a few days, whilst having a break in Sri Lanka. You can fly direct from Colombo and it’s cheaper than from Male. You can go for bike rides, which is really fun and very easy as it’s the flattest country in the world, we ate with the locals who we met on the plane over, had great day trips (bushy island has some of the best and safest snorkeling in the Maldives, it’s utterly magical with electric blue and turquoise waters). It’s not a 5 star, snobby place, in fact it’s quite down to earth, the food isn’t 5 star, but it’s pretty good, especially if you try the local food and if you like fresh fish, then perfect. The guests we met were friendly too and the manager even sorted out an island trip inclusive as we were to miss the scheduled one. I never normally bother to write reviews, but because the people there were so lovely, we wanted to put in a good word. This place is simply awesome in every sense. 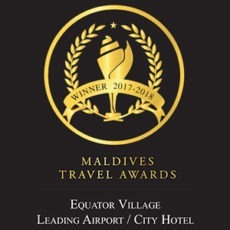 Upon arrival at Gan airport the hotel taxi is waiting to whisk you on a three minute journey to paradise where the most charming Mr Waheed, the manager, greets you with a big smile. The resort is beautifully presented and each spacious room comes complete with an English garden. Our room lady and waiter were lovely, as was every member of staff and we enjoyed many chats and learnt so much about Addu. You can hire really good bikes and tour all over the three islands that connect to Gan, the whole stretch is 14kms. There are lagoons and reefs a plenty and a beautiful nature reserve at the end of Hithadu which is a must see, absolutely stunning. Equator Village does twice daily snorkeling trips, this is fabulous as you get to go to other reefs as well as the house reef. Turtles, mantas, so many anemones and whale shark are commonplace. Make sure you go on the dolphin trip as you see so many spinner dolphins, very exciting indeed. We travelled with three small children and the staff catered to their every need, so child friendly! They loved the ocean, snorkeling and the swimming pool, There is good wifi on the whole village. 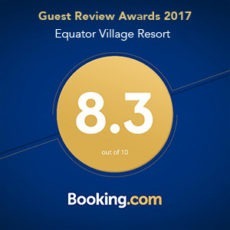 So, thank you very much, Equator Village, you ensured all day smiles on all of our faces and we can’t wait to come back. So glad we booked this! Lots of positive superlatives for this one. Situated at what was the RAF base from years back, the chalets are clean and tidy and a good number are right next to the beach area. Good wifi included, excellent food at breakfast, lunch and dinner, with a few mid afternoon snacks thrown in. Nice size pool with swim-up bar. Exceptionally friendly waiting staff that remember drinks. Most visitors on all-inclusive. On all-inclusive, snorkel trips (free) can be booked twice a day, plus free bike hire that’s terrific for riding around the western side of the lagoon islands to see real Maldivian life from a few watering holes (no alcohol off site) and lots of youngsters playing football. To us this was much better than being holed up on a small resort island, and what’s more the price knocks spots off anywhere else outside of Male. Wonderful place, sweet staff, nice and clean rooms, tasty and delicious food, 2 daily trips with a snorkelling boat. Free bicycles to see the island(s). Attention: Dress appropriately because of religion. Make reservation for all inclusive because that makes your holiday so much easier. We recommend this place and would like to come back another time.